My husband, Kerry, and I dated for ten years. I have long joked that someday we'd write a book entitled, "A Decade of Dating." Well, as per most things, our someday has finally come. 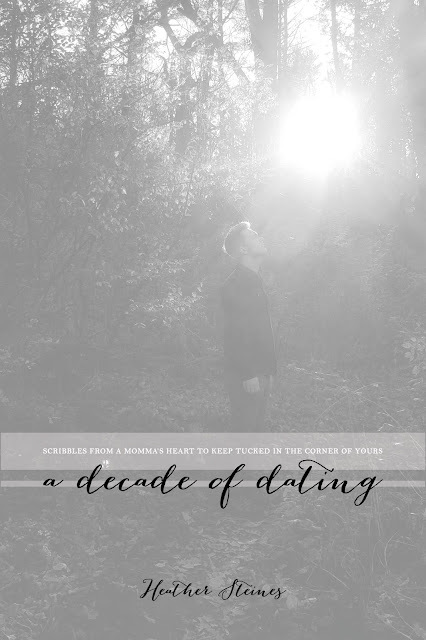 My first e-book, A Decade of Dating, was published this week. I would venture to say that this is an a-typical book. It is really just a smattering of my momma thoughts as I reflected on dating for a decade. The more and more that I pondered a typical writing style, the more my heart was drawn back to something more simple. When I began writing this book, my audience was undefined. As the hours poured into it, though, I realized that my heart was bent on writing it for my daughters. It is something I wanted so badly to get into the heart of my girls. A bit of our story. On this, the eve of Thanksgiving, I find myself overwhelmed with thankfulness. I could have simply let these words lie on their pages for my girls one day, but something in me just felt like there was more. I truly don't think it is the content, though. I think, women, wives, and mothers, we have a voice that reaches further than we'll ever quite know. Likely, our story will mean little, but may I suggest something? Write your story and share it with your few. May, A Decade of Dating, be a bitty encouragement to tell your story. Because, if I have learned anything, stories are worth telling. You can find my e-book here. And to those who have cheered me on in my simple scribbles, thank you.